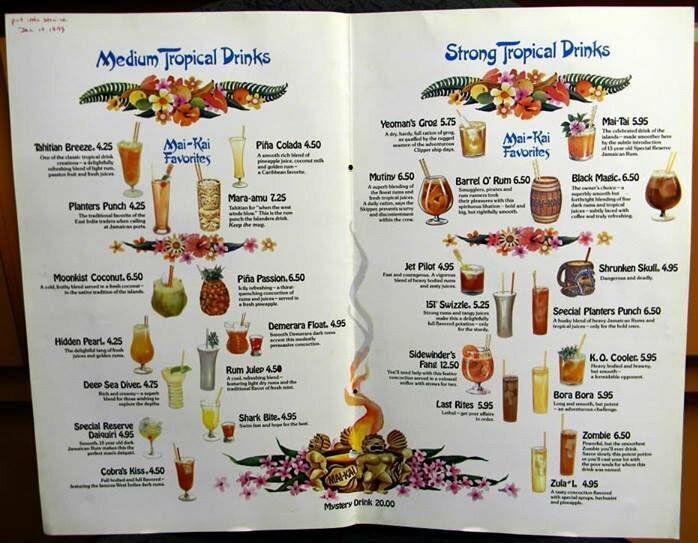 Our expedition through the mysterious tropical drink selection at The Mai-Kai takes a dangerous turn with another mid-century classic from the menu’s “STRONG!” offerings. Tongue-in-cheek drinks lionizing primitivism were common during Tiki’s golden age. The ominous Shrunken Skull and its variations were among the most infamous. The idea was to conjure up a sense of danger lurking in your local tropical getaway. Classic Tiki bars offer the ultimate escape from the mundane day-to-day existence, and every island adventure needs a little bit of macabre yet kitschy risk-taking. In this case, the danger lies in the strong rums that permeate this deadly concoction. 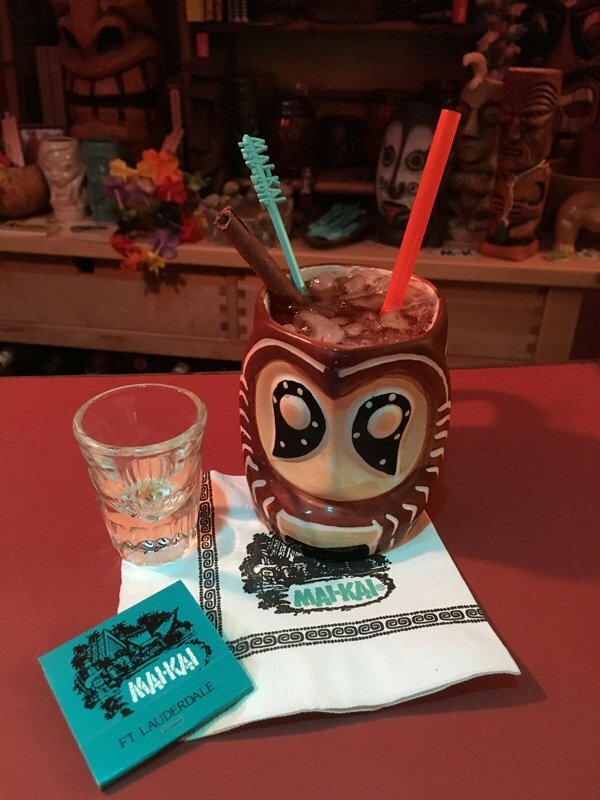 The Shrunken Skull is one of only two current Mai-Kai drinks that feature a rum floater (a shot of rum added to your drink as it’s served). Not coincidentally, the other also comes with an element of danger attached to its name: the Shark Bite. The Shrunken Skull is also one of only a handful of Mai-Kai cocktails to come in its own custom mug, originally a vintage shrunken head design that can fetch more than $100 on the open market. It was replaced by a modern version that is not quite as rare but can still reach $100 or more. 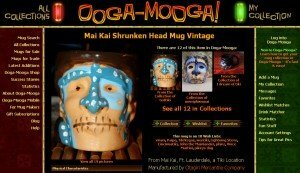 The above links and info come courtesy of Ooga Mooga, the premiere Web site for Tiki mug collectors. This highly recommended resource lets users track their mug collection while showing it off to others. Loaded with photos of great vintage mugs, it’s worth checking out even if you don’t register as a collector. The Shrunken Skull also often comes in an Abelam mug (average price: $30), which features a mask-like design of the Abelam people who live in the East Sepik province of Papua New Guinea. A vintage Abelam mug is typically priced in the $100 range. All of the above mugs have a handle, which is atypical of most Tiki mugs. It’s usually an indication that the mug does double-duty on the dessert menu as a vessel for hot coffee drinks. 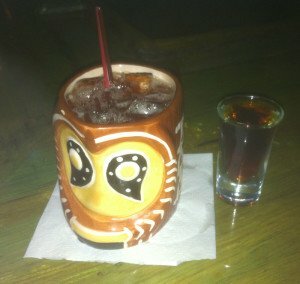 At The Mai-Kai, the current Abelam mug also can be enjoyed with an after-dinner classic, the flaming Kona Coffee Grog. 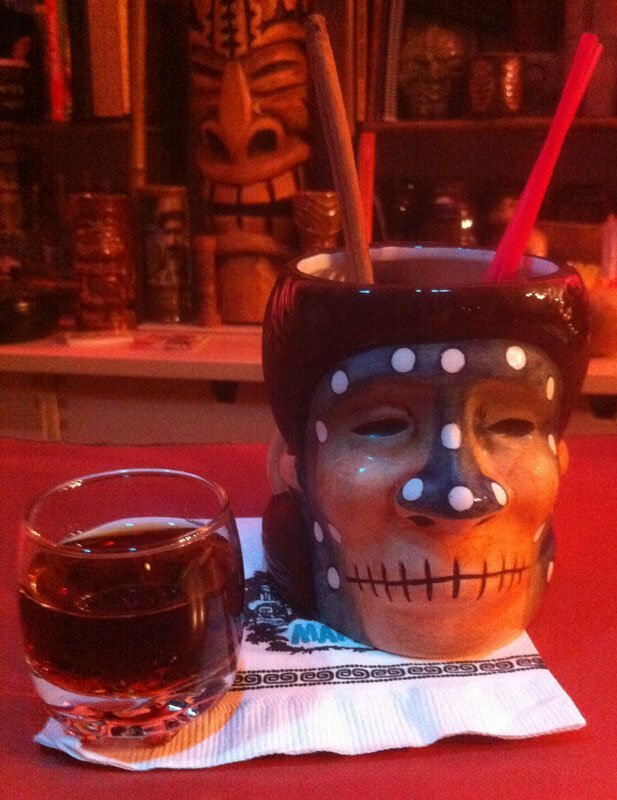 The shrunken head mug is also used for the Tahitian Coffee. I picked up both mugs in The Mai-Kai Trading Post. I’ll be monitoring their prices on Ooga Mooga like any good mug investor. NEW: Check out vintage images of many of the old mugs, including several Shrunken Head mugs, on the official site for Mai-Kai: History and Mystery of the Iconic Tiki Restaurant, the new book about The Mai-Kai by Tim “Swanky” Glazner. Flavor profile: Strong and rich rums, tart pomegranate grenadine, a touch of sweetness. Review: High-octane and potent, yet also fruity and dry. Rich and flavorful with a punch of spicy and tart notes to keep things in balance. 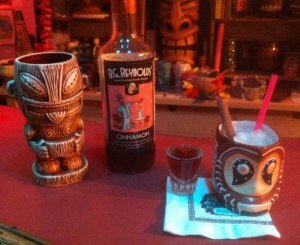 Ancestry: The Shrunken Skull (or one of its variations) was a mainstay on mid-century Tiki bar menus, with most following the simple recipe that Jeff “Beachbum” Berry later published in his 1998 tropical drink bible, Grog Log (see below). 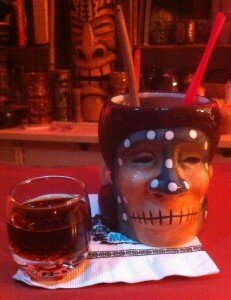 Known as the Skull & Bones, it was also a staple of Don the Beachcomber, the Tiki bar torch-bearer whose menu served as a template for The Mai-Kai. 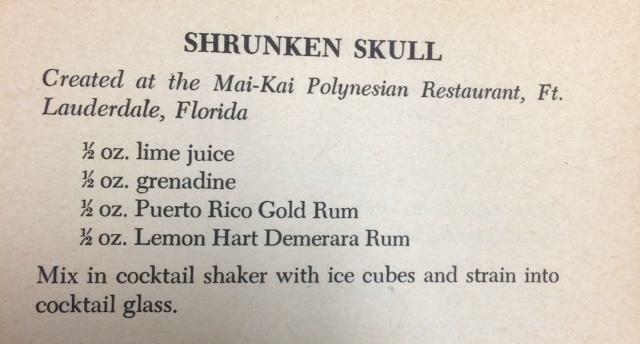 So it’s no surprise that the Shrunken Skull has been on The Mai-Kai’s cocktail menu since the Fort Lauderdale restaurant’s 1956 debut. Bilge: Classic Tiki drinks have begun to inspire a new generation of musicians, such as The Hangmen, who penned the catchy Shrunken Skull Stomp. Crank up this deadly ditty while you indulge in the following recipes. Shake vigorously with ice cubes, then pour everything into a skull mug. Then, I dove deeper into the Tropical Treats book, which features more than 125 food and rum cocktail recipes that spotlight Lemon Hart rum. I realized that the book was co-edited by Leonce Picot, a Mai-Kai assistant manager from 1957 to 1967. It’s likely he had access to the official recipes, and though this one may have been adjusted slightly for the book’s audience, it’s a good bet it’s very close. The Lemon Hart book also features recipes for two drinks that are no longer on The Mai-Kai menu, the Demerara Cocktail (also featured in a Beachbum Berry book) and the Demerara Float. Both also appeared to have been oddly reduced by half (to curtail over-indulging perhaps?). 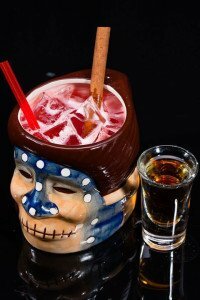 Though the Shrunken Skull recipe doesn’t refer to 151 rum, we all know that, like the Demerara Float, it typically features a floater of the overproof rum popularized by Lemon Hart. This Holy Grail of mixing rums became the subject of much drama over the past decade as it entered, left and re-entered the U.S. market (see details below). The story of Picot is also fairly dramatic and certainly interesting. He’s featured prominently in a chapter in Tim “Swanky” Glazner’s book, Mai-Kai: History and Mystery of the Iconic Tiki Restaurant, released in September. 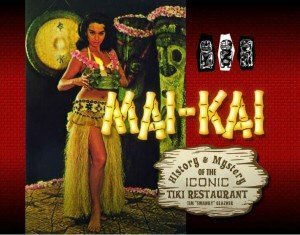 Picot, who helped create The Mai-Kai’s signature Mystery Drink, was also an editor of a series of recipe book while he still worked at The Mai-Kai, boosted by the backing of owners Bob and Jack Thornton. Click here for more on the story of Picot in the Demerara Float review. It’s no coincidence that Berry’s recipe is nearly identical to the Lemon Hart recipe, he recently confirmed. 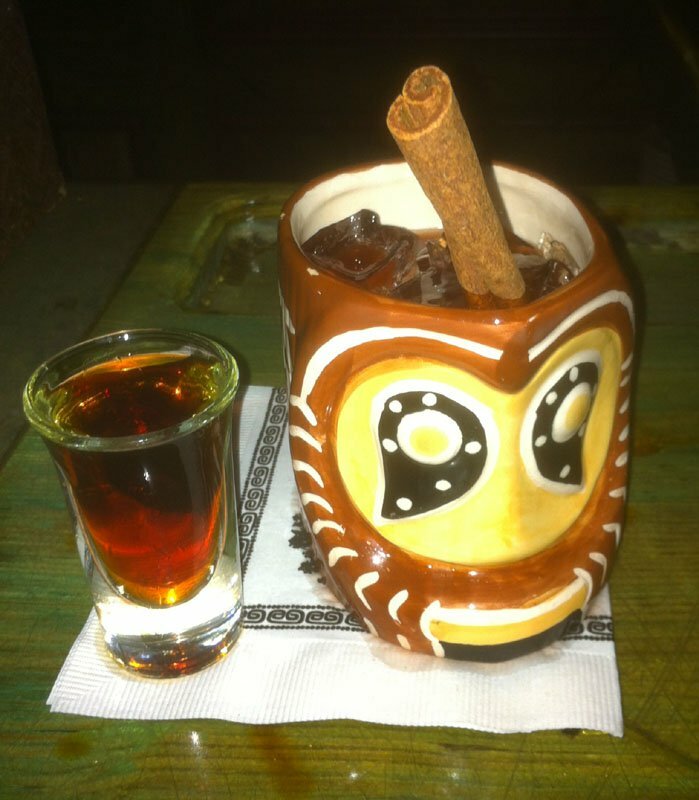 Like the Demerara Cocktail recipe published in Beachbum Berry’s Sippin’ Safari (2007), the Shrunken Skull can also be traced back to Tropical Treats. 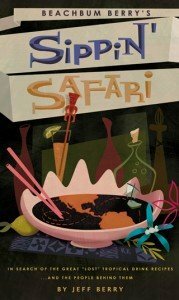 Many more tropical treats await when Berry completes an upcoming 10th anniversary edition of Sippin’ Safari, which will feature updates and recipes from the robust Tiki revival that followed the book’s release. Also included will be additional classic recipes that have never been released. Could we finally see the elusive Skull & Bones? The Bum says yes! For the time being, we’re calling the above an “ancestor/official” recipe since it’s likely this was not a true Mai-Kai original. It’s more likely a take on a common recipe of the day, and/or Donn Beach’s Skull & Bones. Also, it does appear to have been reconfigured at some point. It’s larger and quite a bit sweeter today, hence the tribute recipe below. Stay tuned for another update after Beachbum Berry’s Sippin’ Safari is re-released in 2017. 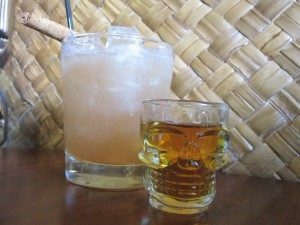 While we have yet to see an official recipe for Don the Beachcomber’s Skull & Bones, it seems likely that it was an inspiration for The Mai-Kai’s Shrunken Skull, as well as other similar recipes. 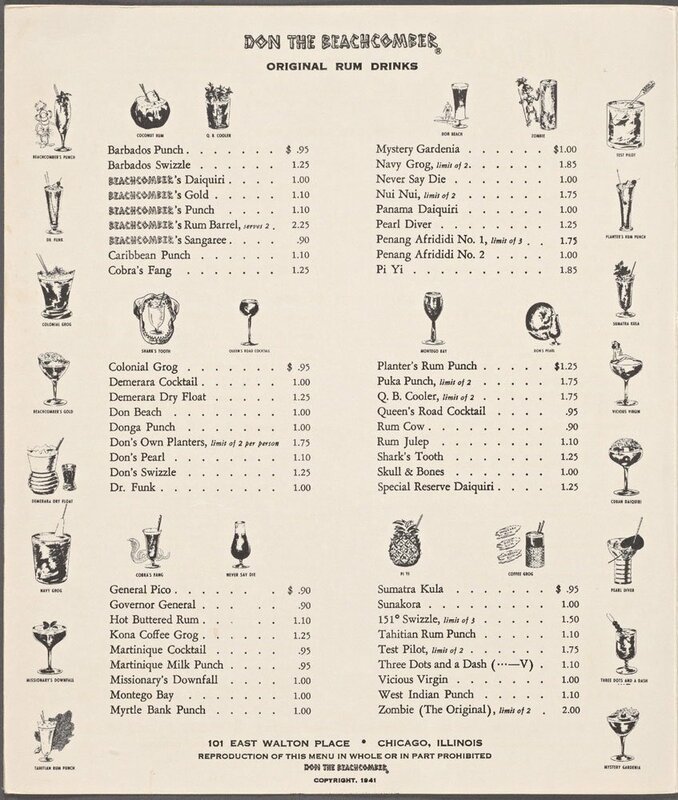 Though it was not as popular as tropical drink pioneer Donn Beach’s other classics, such as the Zombie and Navy Grog, it can be found on old menus such as this one from 1963. That menu comes from the Don the Beachcomber location in Chicago, where Mariano Licudine worked until he came to Fort Lauderdale in 1956 to be the head bartender at The Mai-Kai. Many of the drinks on the menu he helped create, along with owners Bob and Jack Thornton, were based on Don the Beachcomber recipes. They re-worked and improved a great number of them, tweaking many of the names as they went (see story). 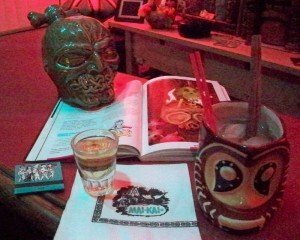 Further evidence that the Skull & Bones and Shrunken Skull are related lies more than 2,000 miles west of Fort Lauderdale, at the only other Tiki bar in the world still serving Donn Beach’s original, secret recipes. The legendary Tiki-Ti in Los Angeles was opened in 1961 by Ray Buhen, an original Don the Beachcomber bartender in the 1930s. It’s still operated by family, including Buhen’s son and grandsons. 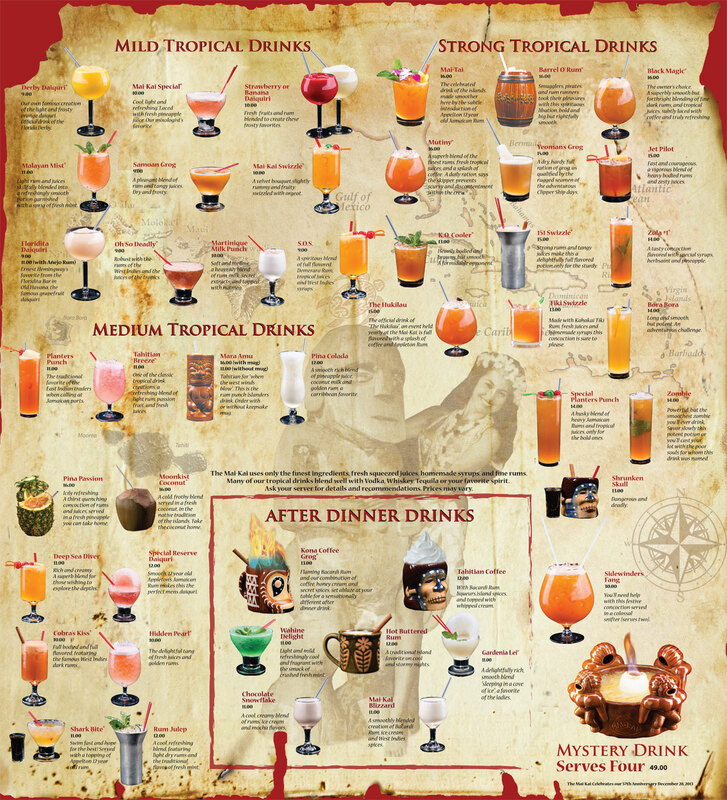 The Buhens’ impressive menu of 92 tropical drinks dwarfs The Mai-Kai’s total of 47, and it also includes the Skull & Bones. While it doesn’t feature a special mug, the drink’s menu description and photo are strikingly similar. It’s touted as including grenadine, lime juice and dark rum. Pour the 151 rum into a standard 1-ounce shot glass. Pulse blend everything else with 1 cup of crushed ice for 4-5 seconds. Pour into a skull mug and garnish with a cinnamon stick. Serve and add the 151 as a floater. Stir with the cinnamon stick. 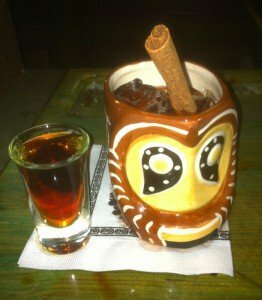 This new version has been in the works for a while, ever since we discovered in June 2015 that cinnamon syrup was not featured in any cocktails at The Mai-Kai (revealed in March 2016 on Tiki Central). We’ve completed revisions to the many tribute recipes that featured cinnamon syrup, but not all have been posted yet. The tweak to the Shrunken Skull was minor. We simply replaced the 1/2 ounce of cinnamon syrup with 3/4 ounce of rich simple syrup. The result is just as sweet, though a bit less spicy. As we’ve discovered, the presence of cinnamon was a mirage. Or more likely, a mix-up caused by the olfactory senses. The cinnamon stick used as garnish plays an important role, and the intense aroma can easily trick you into thinking you’re also tasting cinnamon. But when exactly was the cinnamon stick added? The ancestor recipe above doesn’t include it, and neither does the image on the original 1956-57 menu. Note that the skull mug had not appeared yet either. It was still the same in 1970 (see menu), but by 1979 we see both the mug and the stick sans straw (see menu). The menu image remained the same for decades, until the revamped version was introduced in 2014. We’ve included both the old and new images in the official menu description above. Though it didn’t change the flavor of the cocktail drastically, the recent return of Lemon Hart 151 was significant. Re-introduced to The Mai Kai in 2012, it became unavailable again in late 2014. Hamilton 151 from Guyana filled the gap nicely until late summer 2016, when a new version of Lemon Hart 151 (returning with its iconic yellow label) hit the U.S. market. 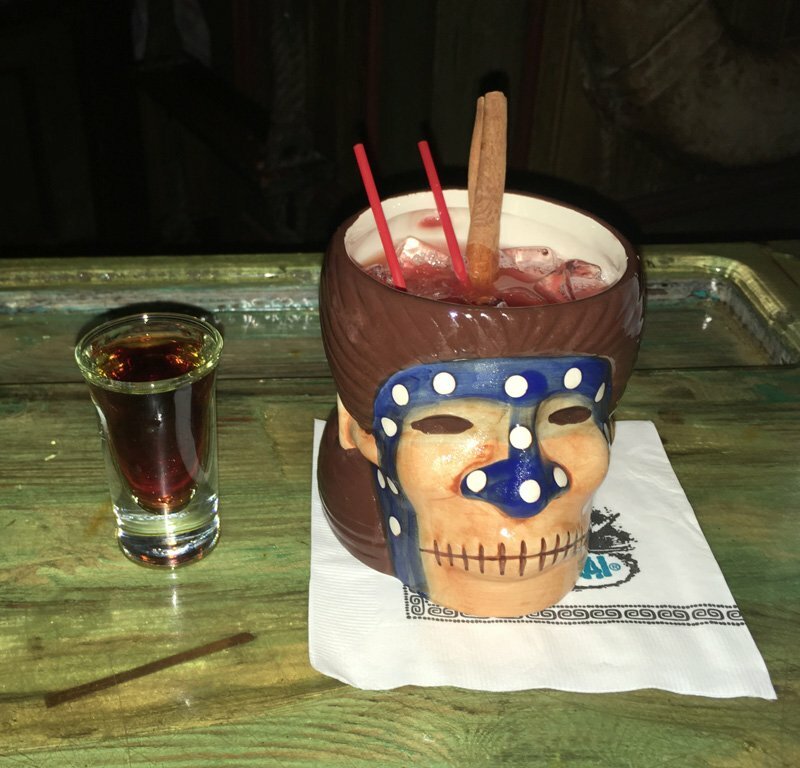 It’s back in use at The Mai-Kai, giving drinks like the Shrunken Skull an every-so-slight assessibility that the more intense Hamilton rum didn’t. While some may say the blend is a bit heavy-handed, it seems to mix well in many classic recipes. See more rum discussion under the original tribute recipe below. We also have several new ingredient discoveries that bring the drink closer to what you’ll taste at The Mai-Kai. One is the recommendation of Monin pomegranate syrup. This extremely tart and intensely flavored gourmet syrup can (and should) be used in place of bland and generic grenadine whenever appropriate. It shines particularly well in the Shrunken Skull, where it blends perfectly with the sour lime juice and strong rums. There’s more info on grenadine below v.1 of the tribute recipe. 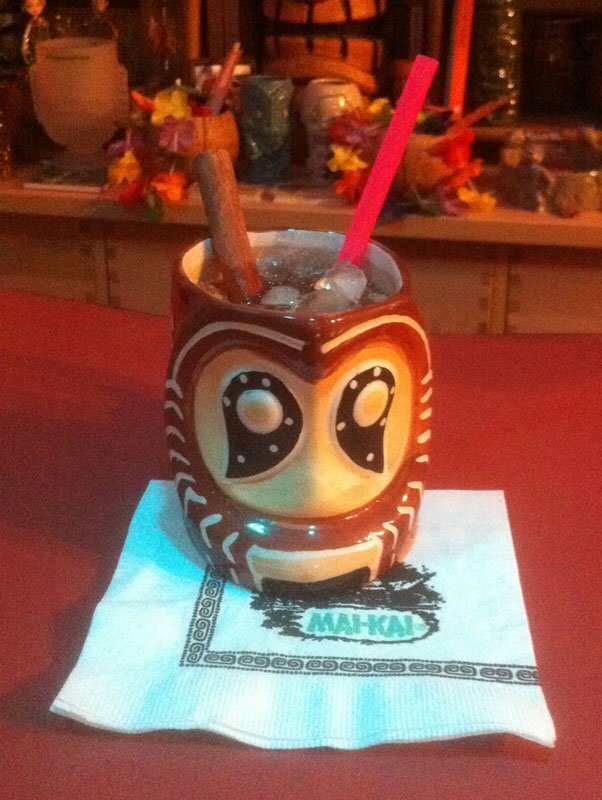 Another recent discovery is the distinctive lime juice used at The Mai-Kai. It’s a very tart and fresh blend of key lime juice that’s unique to Florida. 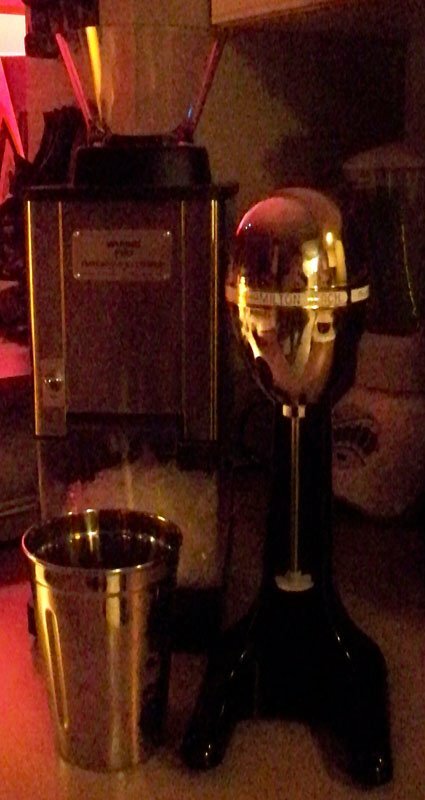 Most Tiki bars will freshly squeeze Persian limes, which tend to be less rich and more sour than tart. I’ve been able to duplicate The Mai-Kai blend by combining bottled key lime juice with fresh-squeezed Persian lime juice. It brings another level of intense flavor to this cocktail, matching the rums and syrup. Click here for more info on the lime and other juices used at The Mai-Kai. 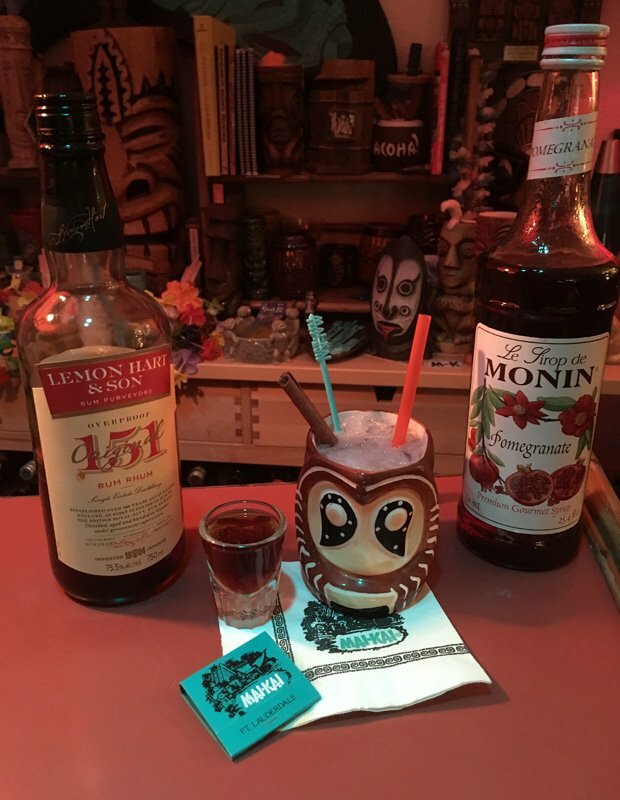 When Lemon Hart 151 Demerara rum returned to The Mai-Kai in April 2012, this dark and smoky overproof rum immediately elevated the Shrunken Skull, which had previously been using the inferior Bacardi 151. Unfortunately, the revival was short-lived. When Lemon Hart 151 was removed from U.S. distribution in 2014, The Mai-Kai was forced to adjust and switch to Gosling’s Black Seal 151 rum from Bermuda. Though not in the true Demerara style (which comes only from Demerara Distillers in Guyana), Gosling’s 151 was a decent replacement. The Shrunken Skull remained very strong, yet rich and flavorful with a punch of spicy and tart notes to balance. The playing field changed again in 2015, when a new 151 rum from Guyana (and Demerara Distillers) was introduced to the U.S. market. Hamilton 151 from importer Ed Hamilton’s Caribbean Spirits was much closer to Lemon Hart 151. It’s more aggressive than Lemon Hart, but it actually made the Shrunken Skull smoother and more even than Gosling’s did. With Lemon Hart back on the market in mid-2016 (see above), there are now more choices. But depending on availability, you may have only one of the above available to you without resorting to online ordering. We recommend Lemon Hart or Hamilton, with Gosling’s only if necessary. One major change in the recipe since the original was posted is the direction to pulse blend instead of shaking the drink. Shaking was consistent with the recipes in Beachbum Berry’s books (and later discovered in a Lemon Hart cocktail guide as noted above), but not the procedure followed at The Mai-Kai. 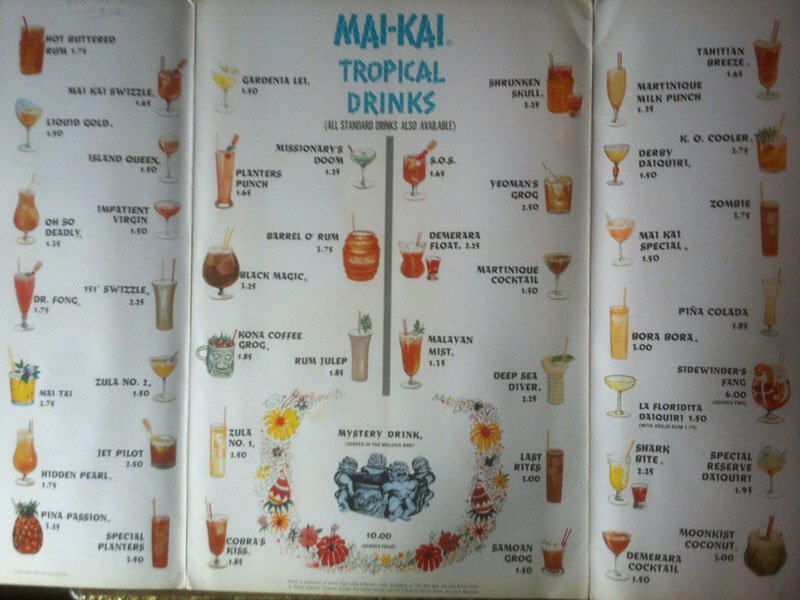 Since posting the original recipe, we learned that all of the The Mai-Kai’s tropical cocktails are either pulse blended in a top-down mixer (see photo) or, in the case of the smooth and icy drinks (Derby Daiquiri, et al. ), blended in a conventional blender. By “pulse,” I mean to hit the blend button and release in rapid succession. This is one of many idiosyncrasies passed down from Don the Beachcomber. 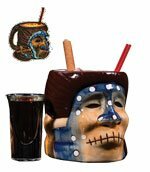 * The shrunken head mug is quite a bit larger than the Abelam mug (12 ounces vs. 8 ounces). Either add more ice, or better yet increase the measurements by 50 percent (1 1/2 ounces lime juice, etc.). Just be forewarned that it packs a wallop. * We recommend a full-bodied cinnamon syrup, such as the one lovingly made by B.G. Reynolds. If using a lighter syrup, increase the proportion a bit. Beachbum Berry’s books include a nice recipe for a homemade syrup that I have always used, and there are many others online. * A dominant flavor in the Shrunken Skull is a very potent pomegranate grenadine. You’ll notice The Mai-Kai drink is very red, like its ancestors. A standard grenadine, even the excellent all-natural pomegranate syrup made by Sonoma Syrup Co., isn’t up to the task. A breakthrough came when I discovered a great recipe in the resource guide in the appendix of Ted “Dr. Cocktail” Haigh’s Vintage Spirits and Forgotten Cocktails: Simply combine the Sonoma syrup (or a similarly robust grenadine such as Fee Brothers or B.G. Reynolds) with an equal portion of Pama liqueur. The result is a very vibrant syrup that’s perfect in this cocktail and others that call for a more up-front pomegranate flavor. If you’re looking for a simpler option, Monin pomegranate syrup is probably the most tart and natural-tasting syrup on the market. It’s intensly tart and bold, plus it contains no artificial sweeteners, flavors, colors, or preservatives. Finally, advanced users may want to make their own pomegranate grenadine. Try this recipe from A Mountain of Crushed Ice or this one from Jeffrey Morgenthaler. * Last but not least, the rums: The original recipe calls for (and we believe The Mai-Kai still uses) an aged Puerto Rican rum such as Don Q Anejo, Ron del Barrilito 5 Star, Bacardi Select, Bacardi 8, or Bacardi Anejo. Feel free to experiment with different aged, Spanish-style gold rums. Cruzan 5 from the Virgin Islands, Flor de Cana 4 from Nicaragua, and Ron Barcelo Anejo from the Dominican Republic are all good options. Lemon Hart is the preferred 151 floater (as discussed above), but it could still be hard to find in the U.S. Avoid a gold 151 rum (such as Bacardi) if possible. Hamilton 151 is the best substitute, with Gosling’s also a decent option. There are more overproof rums hitting the ever-expanding rum market (from brands such as Plantation and Rational Spirits), allowing for many more alternative takes on this creepy classic. Tropical mixology has a long history of reverently borrowing classic recipes. This trend came full circle as it relates to the Skull & Bones and Shrunken Skull when Hale Pele opened in Portland in August 2012 with a tribute to The Mai-Kai cocktail on its outstanding menu of classics, old and new. Hale Pele’s owner and chief mixologist, Blair Reynolds (also proprietor of B.G. Reynolds’ Syrups), said his version includes the additional cinnamon syrup that first appeared in v.1 of our tribute recipe in August 2011. Hale Pele’s Shrunken Skull features “aged Demerara rum with a touch of pomegranate and cinnamon, served with extra rum on the side.” Mahalo Blair! Shake all ingredients except Demerara rum with ice cubes and dump into a 15-ounce old-fashioned glass. Garnish with a cinnamon stick and pour in the shot of Demerara rum. We assume he also uses 151 Demerara rum, though a blended standard-proof rum from Guyana (such as El Dorado 8 or Hamilton 86) would also probably work fine. Reynolds took the opportunity to wax poetically about how ice-cold Tiki cocktails are perfect for cold winter nights, with the potent rums and baking spices warming your freezing bones. Sorry, but having spent more than 30 years ensconced in South Florida, I’m not quite sure what he’s talking about. But I wholeheartedly agree that the Shrunken Skull is a classic drink for all seasons. This entry was posted in Cocktail reviews, Cocktails, Culture, History, History, Mai-Kai, Recipes, Rum, Tiki mugs and tagged 151 rum, Bacardi, Beachbum Berry, Blair Reynolds, Cinnamon syrup, Don The Beachcomber, Hale Pele, Hamilton rum, Lemon Hart, Mai-Kai, Ooga-Mooga, pomegranate grenadine, recipe, rum, Shrunken Skull, Sippin' Safari, Skull & Bones, Tiki mug, Tiki-Ti. Bookmark the permalink. 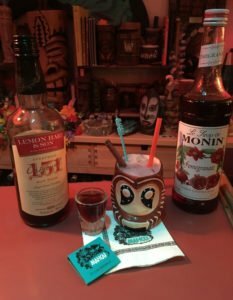 Made up a fresh batch of pomegranate grenadine last night just so I could mix up a couple of new and improved LH 151 Shrunken Skull tribute cocktails. Excellent! And served up in my new Mai-Kai shrunken head mug that I picked up last week they tasted even better! Thanks for the recipe update and for the great review! Nice update on a super interesting post, nice everything! you dig deep! Seems on the sweet side? The Mai-Kai’s strong drinks are typically balanced by elements such as lime and grapefruit juices, Angostura bitters and Pernod, or allspice dram. The Shrunken Skull only has lime, so it tends to lean toward the tart and/or sweet side. It also requires a grenadine that is more tart than sweet. But I’ve also had it mixed a little more on the strong side, so feel free to dial back the grenadine and/or simple syrup a bit. Mahalo Arriano. An update of the Shrunken Skull recipe is in the works. Stay tuned! Any update on the skull and bones recipe?! ?